Home › Ego Power+ St1502 56V 2.5Ah Lithium-Ion Cordless Brushless String Trimmer Str..
Ego Power+ St1502 56V 2.5Ah Lithium-Ion Cordless Brushless String Trimmer Str..
EGO Power+ ST1502 56V 2.5Ah Lithium-Ion Cordless Brushless String Trimmer Straight Shaft, 15"
Style: Straight Shaft Trimmer with 2.5Ah Battery Kit The EGO POWER+ 15 in. 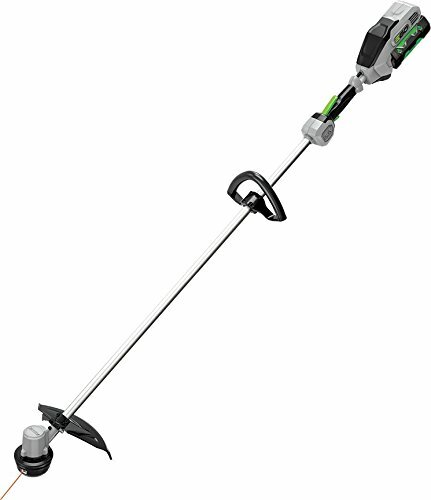 String Trimmer is the next, big step up in power andconvenience for cordless string trimmers. The POWER+ 56-Volt Lithium-Ionbattery and a new, high-efficiency brushless motor deliver the performance ofgas without the noise, fuss and fumes. The 15 in. cutting swath and extendedaluminum shaft make for efficient trimming around your yard. The advanced EGOPOWER+ 56V battery uses industry-leading Arc-Lithium technology to deliverPower Beyond Belief and is compatible with all EGO POWER+ Products. All EGOoutdoor power equipment comes with a 5-year limited warranty and 3-yearlimited warranty on EGO POWER+ System battery packs and chargers. Pleasecontact EGO Customer service Toll Free at 1-855-EGO-5656 any time you havequestions or warranty claims.